“@alexa_chabs: A little belated, but thanks to everyone who came out to support the opening of “Mirrors & Masks”!! It’s exciting to look around and see the tangible results of all our work and how we’ve come since last fall!! The whole process, from writing our entries to installing the exhibition, was full of wonderful challenges that have made me a better, stronger student and curator. Honestly so proud to be part of this class!! This has been a ~self reflection~” March 27, 2017. 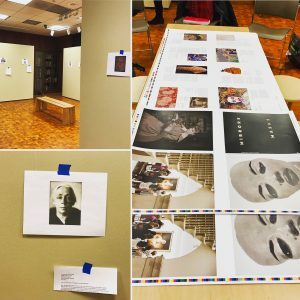 After eight months of work we produced a successful exhibition and a professional catalog filled with thoughtful entries. 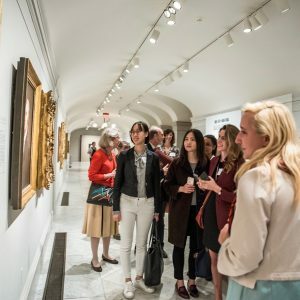 We’ve been to D.C., we’ve met alumnae in the field, museum professionals, scholars, artists, PR and development people, and so many others who have helped shape our exhibition and catalog. And we’ve also taken some great selfies. More importantly, we’re going to take away not just the accomplishments themselves, but also the unique skills and experiences we’ve learned here. Some things we expected to learn across both semesters; how to lead tours, to write concisely/specifically, etc. but then there were the less obvious or expected elements of creating an exhibition. From the practicalities of installation and administration, to organizing public programing, to the challenges of creating an exhibition across space and time. 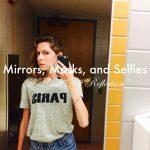 Since a running theme of our 360° has been the Self, mirrors, self-portraiture, and so on, I wanted this digital exhibition to be a kind of “self reflection,” of my personal experience in the class and what I took away from it. Using only images from our hashtag, with two exceptions, I have put together a quasi-chronological exhibition meant to track my personal growth alongside the story of how our exhibition came together. The first use of our class hashtag (#Selfie360BMC) was from one of our first classes when we had only a vague conception of what the catalog would look like. We had yet to pick our objects and I remember thinking, “how’s this going to come together?” I knew it would eventually, but I still felt overwhelmed looking at the Pyson exhibition catalog glimpsed above. Choosing our objects was an arduous process, but the guidelines we decided on were ultimately useful constraints. Picking all photographs, seen above, gave me a wide breath of theory and history, and matched my personal aesthetics. For me, seeing and handling my objects was vital to understanding them. It made me think how lucky we are to have this opportunity. 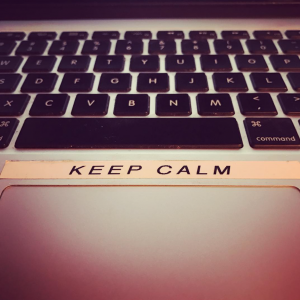 That day, I remember leaving Special Collections feeling prepared and energized to dive into research. Immediately, I was interested in the readings and discussions we had around portraiture. In particular, the readings in the fall armed me with critical theory like John Berger’s essay “Fictions of the Pose,” which I have subsequently used in other classes. These foundational texts allowed me to enter into my objects in a more meaningful way as I began to think about my personal connections to both them and the theory I used. Over the course of the last two semesters we faced expected challenges. We knew signing up for this 360° we would learn to write succinct, intelligent catalog entries, create and install an exhibition, and then give tours to the community. The goal in the fall was producing individual catalog entries. I am anything but concise when writing about art. 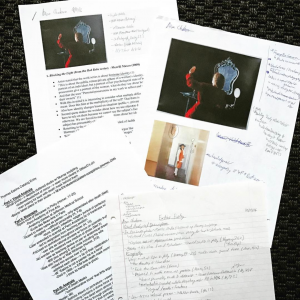 Learning to condense mounds of research I was passionate about into extremely focused, short pieces was important for me to master as a writer and art historian. My numerous drafts and outlines pictured here attest to how, in the long run, I benefitted from the rigorous editing process our entries went through. “@mayayaby: Your local student curators hard at work ” February 2, 2017. 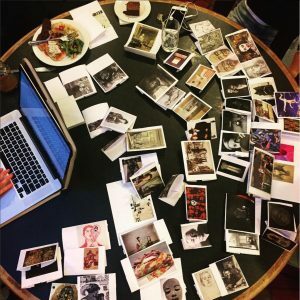 Sitting at a table spread with printouts of artworks I remember being in denial that our exhibition would open in two months. This made the early weeks of the spring critical. We learned through experience how curators consider space, themes, and the implications of display. Overall, it was group work like this and presentations on how we wanted the exhibition to look that forced me think about these issues and gain a practical knowledge of curatorial process. “@curatorbmc: Great tour of Mirrors & Masks by @alexa_chabs today! !” March 30, 2017. Another skill I knew we would learn was giving tours. Developing the confidence to speak in front of groups and lead discussions has been a journey. It was this class that gave me the final push in overcoming my fears. 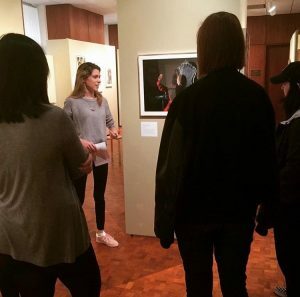 Thanks in part to our conversation with Matt Rueben of the Writing Center, leading the Mask Making Workshop on Community Day of Learning and my public tour of the exhibition were my proudest moments in the course. “@lvmclaughlin: #mood #selfportrait #selfie360bmc” December 10, 2016. Throughout the year we also encountered plenty of unexpected challenges as we read about exhibitions and curating. This led to us learning a number of more unconventional skills, or rather skills or aspects of curating we had not previously considered. 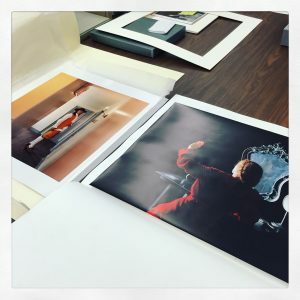 These new situations, like art administration, installation, and so on were often some of the more stressful aspects of the class, as Laurel’s photograph reminds us. However, these moments were often the most educational. 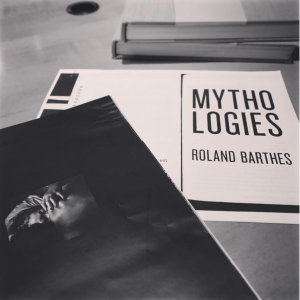 “@alexa_chabs: My love/hate relationship with Roland Barthes continues courtesy of “The Family of Man” January 26, 2017. The timeline of the fall demanded we go straight into doing intense research. Originally this daunted me, but I discovered that I greatly enjoy researching and compiling information on artworks (as well as Carpenter’s aesthetics). It was thrilling to piece together historical and theoretical narratives about my objects. Our research not only showed me what I was capable of, but also how my writing fit into a larger scholarly dialogue across time and space. 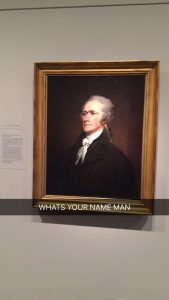 “@alexa_chabs: #tbt to the exact moment I saw Hamilton’s portrait at the @smithsoniannpg (and stopped our entire group in the process lol)” February 9, 2017. 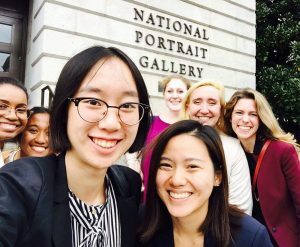 Our trip to National Portrait Gallery and talk with Director Kim Sajet was another impactful moment. 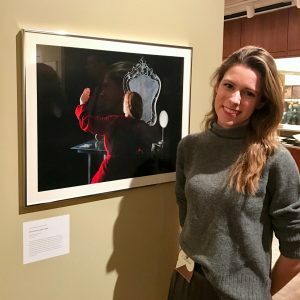 Her discussion of the role of identity politics in museums made me feel more empowered to confront similar issues in my work such as the entry on David Graham’s photograph of the William Penn reenactor. Although this is still an area of improvement for me, her words gave me a framework to consider as I go forward. 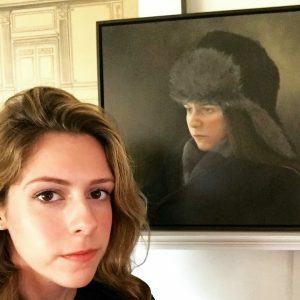 “@alexa_of_troy.tumblr.com: So we went to the National Portrait Gallery yesterday…” October 22, 2016. 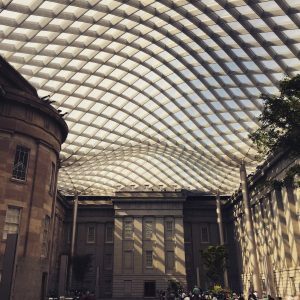 “@alexa_chabs: The @smithsoniannpg wins for best museum atrium as far as I’m concerned ” October 21, 2016. “@alexithymia3: I loved my tour with The Agnes Irwin School today! These young artist really inspire me ” April 21, 2017. One of the more challenging and unexpected aspects of the year was our work in our committees: education, web, and events. Previously, I hadn’t thought a lot about the administrative work involved in creating an exhibition. It was invaluable to be in charge of organizing, scheduling, sending lots of emails, and writing tours for me and the education committee. Ultimately, seeing our hard work pay off made it all worthwhile. “@alexa_chabs: There’s nothing so exciting as handling objects you’ve spent two semesters researching and thinking about and seeing them juxtaposed in such interesting ways! 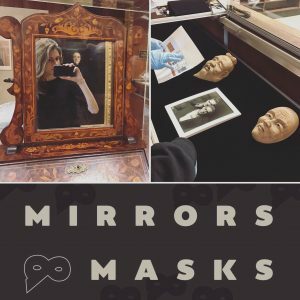 Only SIX more days until our exhibition, “Mirrors & Masks: Reflections and Constructions of the Self” opens in Canaday Library! !” March 17, 2017. Another “challenge,” was that of physically installing the exhibition. 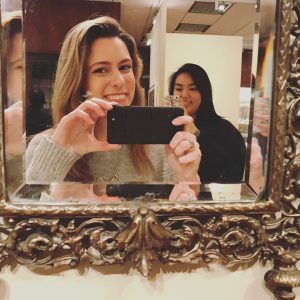 I never imagined having to lift an Ile Ori or a Sande mask or using a hammer to keep an ancient Chinese mirror from sliding off its stand. Nothing has shown me how much I love handling artworks than this. It was all incredibly important, practical knowledge as well as to see how curators solve solve problems on the spot. “@sarah_rigg: So proud of the #selfie360bmc students and their excellent exhibition opening tonight in Canaday. The #bmc360 has been working toward this since September, and now their work is on the walls.” March 23, 2017. The opening made me so proud of all the work we did as a class and how far we have come from last August. I particularly remember talking with a professor I had freshman year who called me “very shy” and I thought it was hilarious because I no longer see myself that way, in part because of this 360°. I sent lots of emails, gave tours, and lifted an Ile Ori; nothing can stop me now. “@alexa_chabs: #tbt to my “Mirroring the Self” tour! And to when @muchachadiablo took a picture of me taking a mirror selfie Our final public tour this semester will be Friday April 21st @ 4pm! !” April 13, 2017. 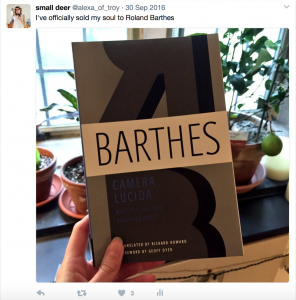 This 360° course cluster helped me grow as a student, writer, and art historian in conventional and unconventional ways. One final thing I will take away from the themes of our exhibition it is that the self is always in flux. I am not the same person I was coming in or leaving. Down the road I am sure some of the images on our hashtag will embarrass me, but in the best ways possible. 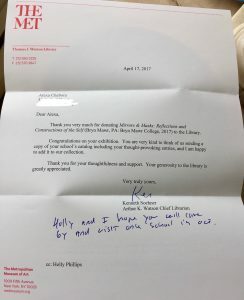 Thank you note from Watson Library. “Congratulations on your exhibition. 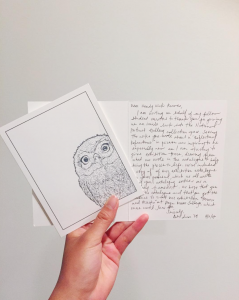 You are very kind to think of us sending a copy of your schools catalog including your thought-provoking entries, and I am happy to add it to our collection.” April 17, 2017. In the summer before this class I told my coworkers how I was doing a yearlong exhibition seminar even though I had no idea what to expect on Day One. 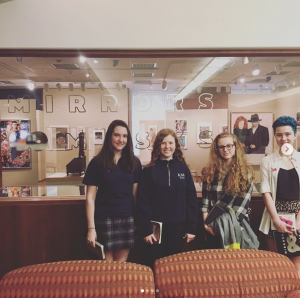 So it is thrilling to see, a full year later, our catalog entered into the Watson Library’s collection and that a piece of this exhibition will live on for a future Bryn Mawr intern to find. 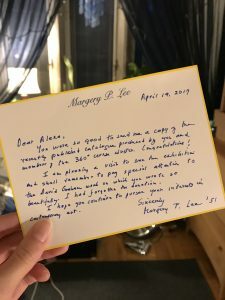 Thank you letter from Margery Lee, ’51. April 19, 2017. 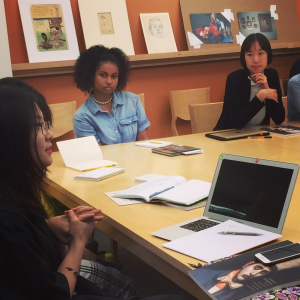 Since one of our final classes was given over to writing thank you’s I wanted to say a final thank you to everyone involved, from donors to curators to artists, for making this experience possible and a positive one. I am so grateful to have worked with so many talented people and to have my love of museums and working with art objects reaffirmed in the process. 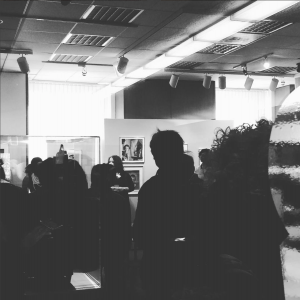 “@abilua: thank you to all of the donors, artists, and friends of the College that helped to make our exhibition possible!” April 5, 2017. Also thank you to Cassie, Maya, Laurel, Alex, Abi, Professor Robbins, and others whose Intagram posts I borrowed.